Analyze, transform and maximize your Segment data with Treasure Data’s powerful Customer Data Platform. Streamline your cloud data with Segment. Segment pulls data from multiple different streams, including mobile devices, web interactions and the cloud, to give you a centralized view of all of your marketing data. It is like a giant magnifying glass on your customers, all in one place and all in one format. When you transform multiple data streams into the Segment data format, the efficiency gains alone will help keep your operation running lean and effectively. Then capitalize on that by integrating Segment with Treasure Data. Treasure Data combines the centralized accessibility of Segment with a low latency, versatile platform that will let you take that data and pull out powerful business analytics to suit your company’s needs. Optimize your data management no matter what device your users are on, improve CRM results and maximize the gains with always-fresh product analysis. It is the best case scenario for your data. Pull your data from one source and allow your Treasure Data install to run jobs without having to translate individual data sets. Keep your data management simple with a cloud data warehouse managed by Treasure Data’s team of experts. Pull your data from a wide range of marketing analytics tools and customer-facing data sources to get the best possible picture of your users. Let your sales team see their full spectrum of available data. Thanks to Segment’s data in Treasure Data’s cloud, they’ll have access to everything, no matter how granular. With a Segment integration in Treasure Data, your sales team will be able to track tags, advertising data and more with ease. Analyze your events with a powerful, SQL-based platform. Transform data, sort it, customize your queries and build data sets as the real time events stream in. It is just that good. Let your people make the most of their data, all of it, with Treasure Data’s platform. Build your data warehouse out of a single format. By integrating Segment into Treasure Data, you can create a centralized, always-on source to access your data in one clean, readable format. Real time access to your data is not just great, sometimes it is essential. With Treasure Data’s platform and Segment’s single-format data structure, that is easier than ever. Enable the Segment Data Connector with a simple, 3 minute setup. Analyze your Segment data beyond what’s possible in Segment reporting with a few lines of SQL. Put everything together with easy visualization tools like Chartio or access your raw events with SQL. Standard Segment Objects: Any standard Segment object, including bounce rates, customer reports, click-throughs and hits. 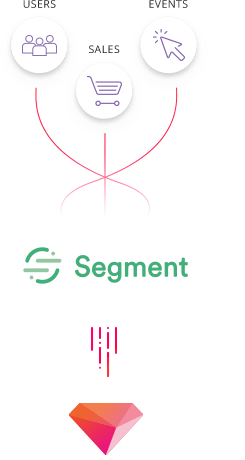 Segment Custom Objects: Create a wide range of custom objects, including tag trackers, customer identification fields and more.